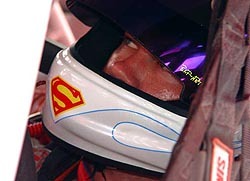 On Shane Huffman’s helmet is a big, painted “S,” which looks much like that of the “S” that Superman wore on his chest in the comics and movies. 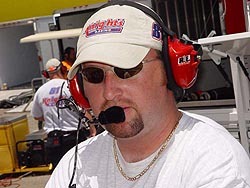 Huffman, who won the 2003 Pro Cup Series championship driving for Xtra Motorsports, found himself without a ride heading into 2005 after Xtra was forced to shut down due to a lack of sponsorship. Huffman then found an opportunity with Knight Racing, a brand new team started up by a friend of the team owner Troy Baird, who owns the car Huffman’s chief Pro Cup rival, Clay Rogers. “You couldn’t have imagined that things would have started like this,” said Huffman’s owner Pete Knight. “I knew Shane and knew his background through a good friend of mine, Troy Baird. “I watched Shane race a few times last year at Bristol and a few other places. He’s got a lot of talent. Really, I was surprised when I called Troy telling him that I wanted to do something that he was available. He was my first choice of who I wanted to race for me. Huffman has dominated the Pro Cup Series Southern Division this year. After his win on Sunday at Myrtle Beach Speedway, Huffman has now won five of the first eight Southern Division races of the season. And it has all come with a new team for Huffman. Actually, not only a new team for Huffman, but a brand new team in general. A team that didn’t exist up until just six months ago. And just like the rest of his wins this year, on Sunday (a day after the originally scheduled event, which was pushed back a day because of rain), Huffman and the Knights Racing team ran their own race and wound up in Victory Lane. Team owner Pete Knight has given Huffman an opportunity of a lifetime. to Rogers. Huffman eventually got the car refired, but not before he found himself in the back half of the top-10. “At the beginning of the race, we had some sort of electrical problem,” said Huffman. “I guess we had some sort of brake fan wire short out there. At least that is what it appeared to be. So I turned the brake fans off and we taped the wire up. It somehow stayed together for the rest of the race. Huffman found himself then running 27th. While Huffman was blasting through the field, Rogers, Mark McFarland and Jason Sarvis each took turns leading. Sarvis appeared to have the fastest car at the track, but a crash while coming up through the field on lap 146 ruined his day. lead from Porter. Huffman spent the next few laps running his #81 wide open, finally catching Rogers on lap 225 and making it around him on lap 228. Rogers came back and pressured Huffman as much as he could on much older tires, hoping to force Huffman into making a mistake, but he couldn’t do it. 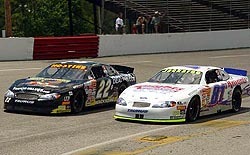 Rogers finished a solid second, but it was again second to his rival Huffman. "Our tires only had 18 laps on them when (Shane) came in and pitted, so I thought we would be in good shape," said Rogers. "It was kind of surprising that he made that run. I guess we just didn't get enough track position to hold him off. He did that same thing at Peach State, and he did it again here, so hats off to him." Porter held on for third, with Michael Ritch and McFarland rounding out the top-five. Huffman (#81), here racing Matt Carter (#22), didn't have a totally easy day on the track on Sunday. With the abrasive Myrtle Beach Speedway taking its toll on tires, a number of teams used different pit strategies during the race. Some pitted earlier and some pitted later. Some pitted for two tires, while some pitted for three and others for four. After pit cycles worked around and out, Huffman was back in the lead on lap 123. He lost it on 186 to Steve Wallace, but regained it a lap later, before losing it for good to Toby Porter on lap 197 after Huffman’s tires were junk. It all comes back to “SuperShane” and his new team. The chemistry is just unbelievable. And for Huffman, the win also gave him a part of Pro Cup history. 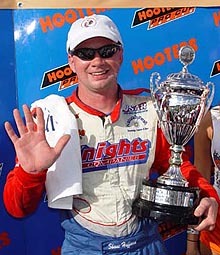 The win moved him into second all-time in the Pro Cup Series win list, passing Mario Gosselin. "It's pretty cool that we passed Mario for wins and tied him for poles this weekend. Twenty wins is big in any series, but it's especially big in a major touring series like this. I've got the best opportunity I've ever had here with Knight's Racing, and I'm having a blast. After Sunday's win, Huffman now has 20 career victories, a quarter of which have come this season alone. “I don’t know if we can keep it going. If you could put your finger on what it was or develop a formula for it, you would be a millionaire in racing. I don’t know what it is. It’s like he’s Superman or something.